One- and two-year programs like Northeast Iowa Community College allow students to get an education for less money and enter the dairy workforce much faster than the traditional four-year route. Allison Babler says Lakeshore Technical College prepared her well, took a year to complete and left her no student debt. 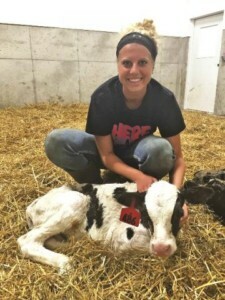 Two years ago, during the summer before her senior year of high school, Babler began working part-time at Kinnard Farms near Casco, Wis. At the time, Kinnard Farms was milking 3,000 cows; it has since doubled in size. The dairy’s growth presented Babler the opportunity to return to Kinnard Farms as a full-time employee. Babler’s mentor and Kinnard Farms’ herdsman Shaun Hardtke encouraged her to look at Lakeshore Tech as a post-high school education option. Hardtke had walked a similar path as Babler, graduating from LTC in 2006 and starting his career at Kinnard Farms after working there as a high school intern. He, too, planned to enter the dairy industry after high school, but was unsure of what path to take. “Going to Lakeshore Tech for school helped narrow that path to my passion and what I really, truly wanted to do,” Hardtke says.